IF you haven’t seen this movie yet, try not read up any spoilers or reviews before you watch it! If when you buy a movie you like to have it available in all media options, and you like or are curious about the movie “The Theory of Everything”, $5 is all it gets to get it in a bundle that includes the BluRay disc, the DVD disc AND a digital copy too! All these from Amazon actual. You can buy up to five bundles at this price. There is a catch however, this is marked as an Amazon Add-On item, so you must place an order totaling $25 or more in Amazon shipped products. If not, the shopping cart will simply refuse to let you buy it. Grab your Amazon wallets and add to cart now! $10 is all it takes to get this Limited edition collector set that features a trio of Neill Blomkamp Films! His breakout film “District 9”, the fresher take on AI robots in “Chappie” and the movie ruined by Matt Damon (“Elysium”), by far the most conventional and predictable of these three movies. The limited edition is because you get a 64-page digibook, along with a number of limited release special features on the discs. including an hour of specials on Chappie and an alternate ending. 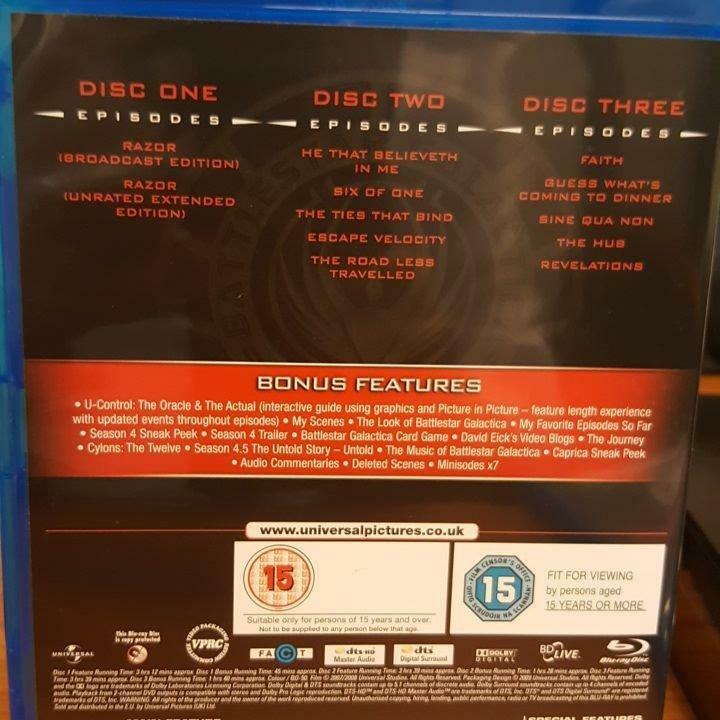 The other two movies get extras too! Season 1 of the Japanese anime “Attack on Titan” is streaming on Netflix and Hulu. But if you want more content and in BluRay quality, the Season 1 BluRay set (that’s 25 episodes) with some director commentaries and BluRay specials is on sale for $28 with free shipping at Amazon by Amazon actual. Limit up to two sets per customer at the sale price. Season 3 of the Attack on Titan anime is scheduled to come out at some point between Spring and Summer in 2018 and it looks like it will be Season 1 rather than Season 2 length. Season 2 “only” had a dozen episodes. “Killjoys” is an underrated and underappreciated space science-fiction TV series that is airing on Syfy and Canada’ SPACE channel. It has its own unique style and personality, which may not be for some people, HOWEVER, this has a lot of in-world mythology and world-building, and there is an underlying story underneath it all, so you are not just watching episodic television, it has an overarching arc. The TV show is currently not available at any of the major streaming services (Netflix, Hulu, Prime), which makes this sale even better, because for under $17, you get the BluRay sett with Digital HD (Ultraviolet, through NBCUcodes) at amazon.com. This is a limited time sale, with up to three sets per customer during the sale. Meanwhile Season 1 goes for just under $21, likewise in a BluRay set with Digital HD. There’s also a music discovery component to the show as they play a lot of new and fresh music throughout the episodes! Lord of the Rights time! If you like the theatrical editions of the trilogy, and you like the BluRay format, you can get those three movies on a BluRay set for $10 total at Amazon by Amazon actual. Limit three collections per customer during this sale. These are not the Extended editions with the bonus footage Petyr Jackson added later on. This is the version of the movies that was shown in the movie theaters (thus the “Theatrical”). If you are missing the second half of the final season or if you only want to have the last ten episodes, the BluRay with Season 4.5 of the rebooted Ronald D. Moore “Battlestar Galactica” TV series is on sale for around $5.30 at Amazon.com, and that’s not all. This is Prime eligible, ships from Amazon’s warehouses, and it is not an Add-On item, so if you are a member, you get it delivered to you without the need for additional purchases to get free shipping. This comes in three discs, with a total of ten episodes, episodes 4-11 to 4-20. If you don’t remember what’s what, refresh yourselves with the episode list at the very useful and very lightweight on the browser epguides.com. Richard Hatch fans. Okay, not just him, but fans of the original Battlestar Galactica. A version of the movie-pilot (125 minutes commercial-free runtime) of the series is now on sale, in the 35th Anniversary Blu-ray edition, for just $8 at Amazon.com, same price as the DVD version. Check the reviews if you are looking for a specific version/edit of this (yes, there are multiple). Multiple versions are on the same review page, so to find the reviews for this particular anniversary blu-ray, use this link that pre-filters for it. There are forty reviews for this particular version out of a total of 280+ for all versions. Science deserves its deals too. The critically acclaimed documentary “Into The Universe” with Stephen Hawking is currently on sale for $8.50 and eligible for free 2-day Prime shipping at Amazon.com. It averages 4.5 out of 5 with 140+ customer reviews. Runtime is about 130 minutes, so it’s accessible, you don’t have to devote a month to it. It is essentially three TV episodes long. It is a Discovery and Gaiam production. The BluRay is currently slightly cheaper than the DVD even! If you like the Lord of the Rings movies as they were seen in the movie theaters, but don’t want all the extras and extended scenes, you can save a lot with this special edition at amazon.com, the original theatrical release trilogy (three LOTR movies, not Hobbit movies) for $13 total. You just get the movies on BluRay, no Digital Copy. Limit two per customer during this sale. Free 2-day shipping if you are a Prime member (or if you select slow shipping, you get a $2 digital credit towards future digital purchases).